Ever wonder what happens to your surveys after you send them out? SoGoSurvey’s Distribution Dashboard tracks survey participation for you and shows survey results as they happen. This post gives you an overview of its features and how you can use this information to get higher open rates, better response rates, and decrease bounces and unsubscribes. To track a survey you’ve already sent out, go to Launch a Survey, select your survey, and click Track Survey. You’ll see an overview of your survey in two forms: graph view and report view. The bar chart at the top gives you a snapshot of invitations and responses by all the different ways you published your survey. In the example below, the survey was distributed via email (Single Access URL), website (Multi-Access URL), and offline (Survey Access Codes). In addition, some responses were imported from another source, such as a paper survey. You can also filter the list by status. For example, you may want to see all the bounced email addresses. Just click the little drop down arrow next to Status at the top of the report. Want to see how someone responded to the survey? Click on their email address. Of course, they have to have completed the survey. 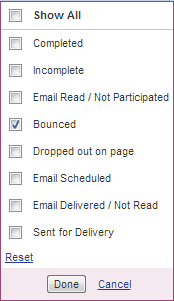 Click the red exclamation point next to the bounced email under Delivery Status. This will show you whether it was a soft bounce or a hard bounce. A hard bounce happens when the email address isn’t good anymore, such as when someone leaves the company. A soft bounce happens in cases where the email address is legitimate, but the mailbox may be full or the server went offline when you sent out the emails. Give the details to your email administrator to help determine why emails are bouncing. The Delete button deactivates a survey link for that email address for this particular survey. BE CAREFUL – if someone has completed the survey, this will delete all their responses permanently. If you select Delete All, all the invitations listed and their responses will be deleted forever! If you want to delete multiple invitations, check the box next to each invitation and click Delete. When you select Export, the entire distribution table is exported to Excel where you can further sort and analyze the data. In addition, the exported report lists all the unique keys and URLs generated for each email. This is very helpful if someone didn’t get the email or lost the link. You can then email the URL to that person in a separate email. Decide whether you need to send reminders – Do you have a lot of non-participants? You may want to schedule some reminders and try sending those in plain text vs. HTML to see if it increases participation. Get higher open rates – If most of your emails weren’t opened, you can create a new “Did Not Open” list, experiment with different email subject lines and send them out again. Improve response rates – You can segment those who completed the survey into a new email list and send future surveys to that group. Decrease unsubscribes and bounces – See what your unsubscribe rate is and test different variables to reduce that. Troubleshoot bounced emails to clean up your list. I think you’ll agree that the Distribution Dashboard is a powerhouse of information! What are some of the ways you’ve used it?